Tick-borne diseases have rapidly become a significant public health issue in Maine and throughout much of the United States. The incidence and distribution of these pathogens continues to increase, often resulting in severe health issues for those affected. Of the multiple tick-borne diseases found in the U.S., five are known to occur in Maine, including Lyme disease, anaplasmosis, babesiosis, Borrelia miyamotoi disease, and Powassan encephalitis. All five of these diseases can be transmitted by the deer tick (Ixodes scapularis). Early treatment of tick-borne disease is critical. If you suspect you may have a tick-borne illness or have questions about tick-borne disease, consult your doctor immediately. The Tick Lab focuses primarily on ticks themselves and does not offer medical advice. Lyme disease is an infectious, inflammatory disease caused by the bacteria Borrelia burgdorferi. Common signs of Lyme disease include headache, fever, chills, joint and muscle pain, fatigue, and a characteristic expanding rash known as erythema migrans. The symptoms of Lyme disease can be variable, particularly erythema migrans, with less than 50% of reported cases in Maine exhibiting the bullseye-like rash. Long term complications from untreated infections can result in severe arthritis, facial palsies, meningitis, and carditis. Though Lyme disease is readily treatable with oral antibiotics, an estimated 10 to 20% of patients suffer from persistent, non-specific symptoms in a condition recently classified as post-treatment Lyme disease syndrome (PTLDS), the causes of which are unknown. Lyme disease is the most commonly reported vector-borne illness in the United States with approximately 30,000 new cases reported annually. 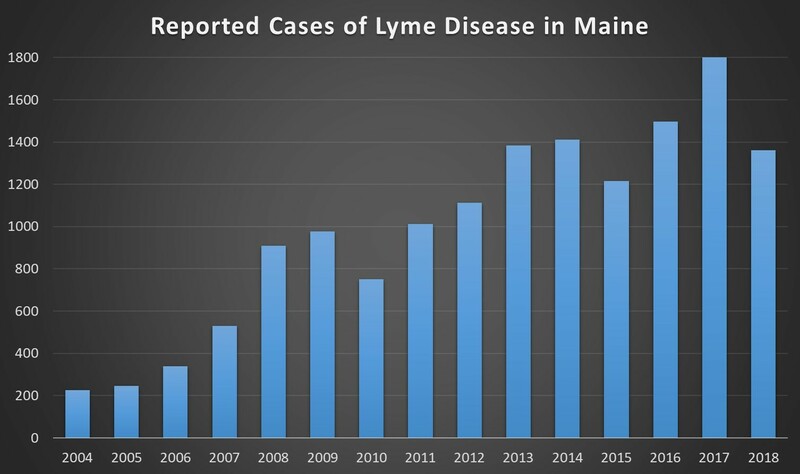 The first documented case of Lyme disease in Maine was identified in 1986 and the incidence has been steadily increasing within the state ever since. Anaplasmosis is caused by the bacteria Anaplasma phagocytophilum and though less commonly reported than Lyme disease, the number of reported cases has been increasing over the past twenty years. 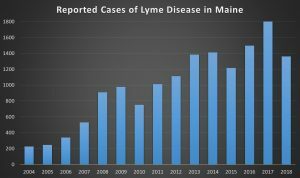 This trend has been especially pronounced in Maine over the past 6-8 years, with cases nearly doubling annually from 2012 through 2017. Anaplasmosis is transmitted through the bite of an infected deer tick (Ixodes scapularis). Cases can range from mild to fatal with extreme symptoms including encephalitis and meningitis, however, severe cases are relatively rare. Babesiosis is caused by a protozoan parasite (Babesia microti) that infects red blood cells, potentially causing hemolytic anemia in infected patients. The incidence of babesiosis has fluctuated in the United States with the number of annual cases generally staying between 900 and 1,800. The incidence in Maine has increased slowly over the past ten years, reaching a high of 117 reported cases in 2017. 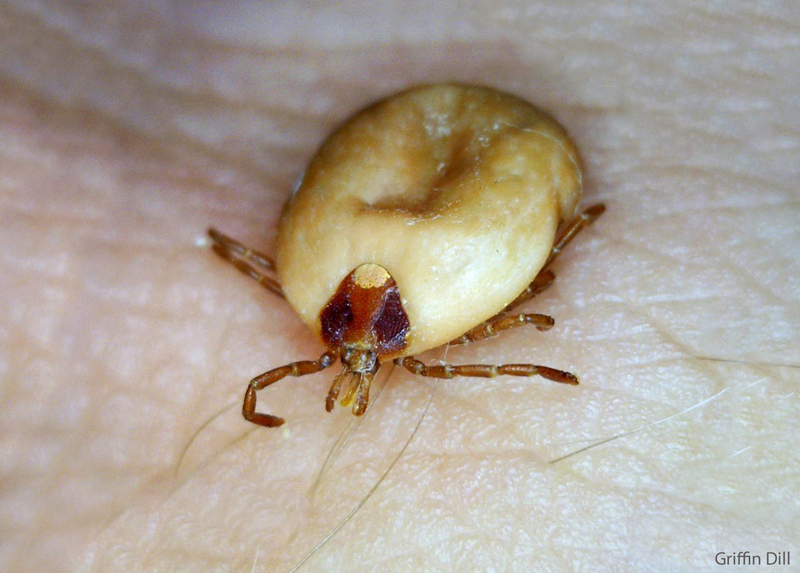 As with Lyme disease and anaplasmosis, babesiosis is transmitted through the bite of an infected deer tick (Ixodes scapularis). Borrelia miyamotoi is a spirochetal bacteria that is closely related to the Borrelia species that cause tick-borne relapsing fever. It was first identified and isolated from ticks in Japan in 1995 and has since been detected in deer ticks in the eastern United States. Borrelia miyamotoi disease was first documented in Russia in 2011 and then in the U.S. in 2013. In Maine, cases have been reported since 2016, but have remained in the single digits. Unlike other tick-borne pathogens in Maine, Borrelia miyamotoi can be passed from mother to offspring through the eggs, thus making larval ticks a potentially important stage in the transmission cycle. Powassan encephalitis is a potentially fatal neuroinvasive disease that was first discovered in Powassan, Ontario in 1958. Subsequent cases have emerged in the United States, though the number of reported cases remains low. Cases in Maine were first reported in 2000 and annual numbers have remained in the single digits. Powassan encephalitis is caused by two strains of the same flavivirus. The first strain (Powassan virus) is vectored by the woodchuck tick (Ixodes cookei) and to a lesser extent the squirrel tick (Ixodes marxi). The second, newly-recognized strain (deer tick virus) is transmitted by the deer tick (Ixodes scapularis). 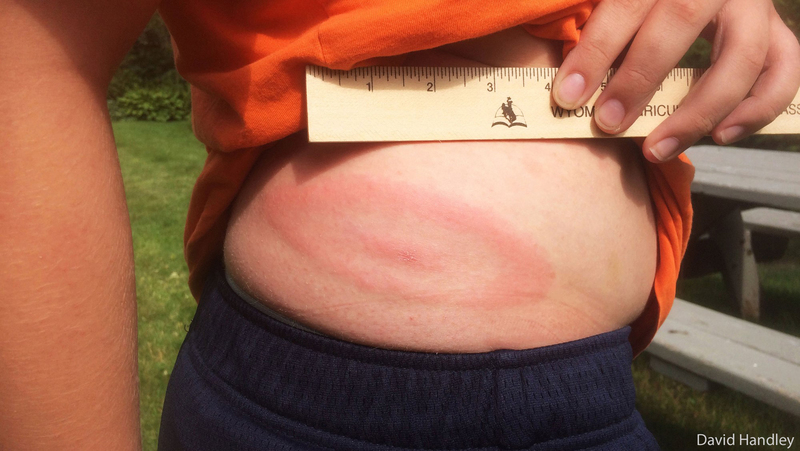 Alpha-gal allergy is a potentially severe food allergy thought to be caused by the bite of a lone star tick. Though the lone star tick is not commonly found in Maine, cases of alpha-gal allergy have been reported. Alpha-gal (galactose-alpha-1,3-galactose) is a sugar molecule found in red meat that can be transferred to humans through lone star tick feeding. In some people, this triggers an immune system reaction that may produce delayed allergic reactions when they eat red meat. While most food allergies take just minutes to cause a reaction, alpha-gal allergy’s delayed onset can take three to six hours.